Bubba Munoz grinded out the tough yards for South Hills. (Covina) – South Hills broke open a close game in the second half and the defense did the rest in a 41-6 rout of La Mirada Friday night at Covina District Field. The Huskies only led 12-6 at the half before going on a 29-0 run in the second half. The defense however was the story. They held the Matadores offense scoreless and allowed less than 50 total yards on the night. The Mats only score came on a 78-yard interception return by Maximus Ahoia in the second quarter that cut the South Hills lead to 9-6. La Mirada punted on five of their eight possessions and turned it over on two others. South Hills was in complete lock down mode. South Hills quarterback Khalil Ali threw for 106 yards and two touchdowns -a 10-yard touchdown strike to Alex Rodriguez in the first quarter, and a 16 yard bullet to Thonye Charles in the third. Rodriguez had a big night for the Huskies, also returning an interception 36 yards in the fourth quarter for the game’s final score. Charles also caught a 55-yard TD pass from Justin Armendariz on a trick play to get South Hills going in the third quarter. 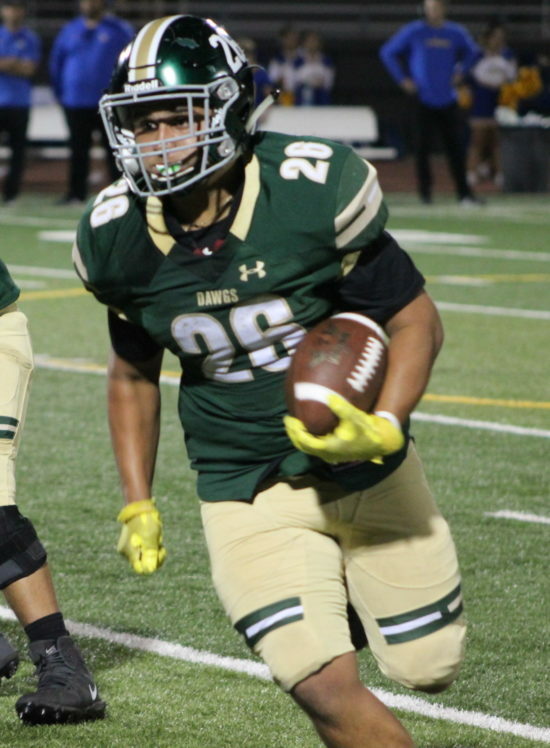 Juaquin Elliott was the workhorse for the Huskies rushing 27 times for 100 yards and a touchdown while Bubba Munoz pounded out six carries for 40 hard earned yards. The Mats led by Puka Lauago had 40 yards on the ground but quarterback Brandon Nunez as held to -2 yards passing and backup Luke Martinez threw the pick six. South Hills remined perfect at 4-0 with the victory while La Mirada dropped to 0-5. 5 Comments to "Huskies Lock Down La Mirada"
I completely agree with everything you guys are stating. Mike Diaz is a great student of the game and now quickly becoming a professor of the game. I’ve seen him grow through high school, college and a brief stint as a pro. As for what has happened to LM since Moschetti departed, I blame Moschetti. He turned LM football into a program that required top college recruits to climb the divisional ladder. He wanted to compete at a higher level but wasn’t willing to do it with just his local talent. When you bring in talent from outside your immediate district, you create dissension and animosity amongst the troops. I think it was 2009 when they beat Garden Grove for the championship in their division. That was with local talent. After that, it was never the same. Greed will get you every time. I agree with you sir ! Coach Diaz is an outstanding O coordinator ,he just doesn’t have the weapons . Im glad he put lenses in his glasses now to see his season unfold in front of him ! Coach Mikey D is still a guru in my book! Who wins a South Hills vs Mayfair CIF D6 Finals?? ?